The 4 star, Empire Hotel & Spa Hotel + Spa enjoys sea views and is close to the Great Orme in Llandudno; North Wales’ premier seaside resort. Air conditioned en-suite rooms at the Empire Hotel & Spa include refrigerator, colour television, DVD player, free Wi-Fi, complimentary toiletries, hairdryer, safe and beverage making facilities. Rooms are serviced on a daily basis. Lift , library, luggage storage and free parking also feature here, as do facilities for business and social events. Massage, body and facial treatments; plus sauna, health club and indoor pool, are available in the Spa areas. Following a choice of breakfast, there are 2 restaurants and a coffee shop, plus a room service facility. A full range of drinks is available in the bar lounge. This seafront hotel is close to the Home Front Museum, Llandudno Pier and to the town centre’s many shops and ancillary attractions. Good value and appealing meals. Spaces are to the side of the hotel and there rarely seems to be any lack of them, so it’s safe to say that parking is hassle free. Mountain, sea and town views are all equally attractive and a really nice addition to the attractive hotel rooms. 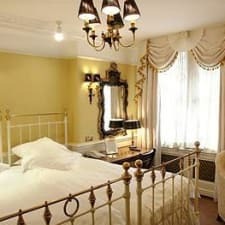 Beds are comfortable and rooms are nicely finished off with chandelier lighting. Nice touch, that. Parking is a bit of a hotch potch + made up of a number of small parking areas. Most are to the west of the hotel but they aren’t identified very clearly. There are signs of tiredness about the rooms and tell tale signs of lack of attention by cleaning staff. There’s a tendency, for example, to miss window ledges and corners and they’ve fallen for the obvious one: the rim under the toilet bowl. Gottcha!